Advanced Dungeons and Parenting: The SF Library: Mandatory Anthology #1 "Adventures in Time and Space"
The SF Library: Mandatory Anthology #1 "Adventures in Time and Space"
If you want to get a good sense of the "Golden Age" of Science Fiction, there is no better volume to have on your Science Fiction bookshelf than the Raymond J. Healy and J. Francis McComas edited Adventures in Time and Space. "Critics have called this the 'definitive' anthology of science fiction stories. We agree -- not just because it flatters us, but because it is an accurate judgment of the magazine editor who first published most of the stories in this collection. That man was John W. Campbell, Jr. And perhaps no one man ever had a greater influence over a literary form, for Campbell single-handedly revolutionized the writing of -- and possibly more importantly -- the thinking in modern science fiction. He created what all of us -- readers, writers and editors -- refer to as the Golden Age of twentieth-century imaginative literature. You are about to read the golden bests of that golden time. 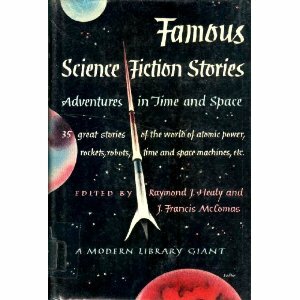 Prior to Campbell's advent as editor of Astounding Stories in 1937, science fiction had badly deteriorated from the standard set by its great founders, Wells and Verne. While some editors strove for genuinely interesting scientific speculation, they allowed such challenging postulations to be presented in a framework of atrocious prose. Generally, however, magazines nominally presenting science fiction offered science that was claptrap and fiction that was graceless and dull. As I read those words today, I don't think that Healy and McComas are overstating Campbell's influence. Campbell is an editor whose shadow looms large over the genre, just as Lin Carter's looms over fantasy, or August Derleth's looms over the Weird Tale. 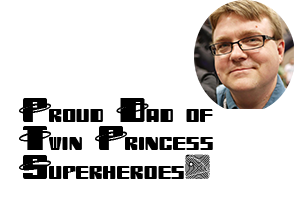 There have been great editors since Campbell, but he was among the first great editors of the genre. This is especially telling in the themes of the stories he edited. Read Asimov's Foundation stories and A.E. Van Vogt's Space Beagle and Slan stories in one straight run, and you will notice themes emerging. Asimov's "psychohistory" and Van Vogt's "nexialism" sound very similar to each other thematically, and they are applied in similar ways. Both of these disciplines are collections of the skills of other disciplines, they are a kind of "master science." This optimistic theme of a rigorous social science that could better our lives is a common undercurrent in Campbellian fiction. It is one of the hallmarks of his tenure...as is optimism itself. It is sometimes striking how optimistic Campellian fiction is. Even when it is skeptical -- like Herbert's Dune -- it contains optimism. For what are Mentats and the Bene Gesserit, but practitioners of Nexialism and Psychohistory? Robert Heinlein's "Requiem" and "The Roads Must Roll"
Henry Kuttner and C.L. Moore's "Time Locker" and "The Twonky" -- written as Lewis Padgett. Moore and Kuttner seem to be to be vastly under-read by the modern SF reader. C.L. Moore is arguably my favorite SF author, her combination of the weird and the wondrous are magnificent. John W. Campbell, Jr's "Who Goes There?" which is the story that the classic SF films THE THING FROM ANOTHER WORLD and THE THING are based upon. Campbell published this story under his Don A. Stuart pseudonym. A.E. VanVogt's "Black Destroyer" -- possibly my favorite SF story. Readers will notice its influence in Ridley Scott's ALIEN and in the STAR TREK franchise. The Space Beagle and its mission are surprisingly similar to that of the Enterprise and nexialism and Mr. Spock have a lot in common. Harry Bates' "Farewell to the Master" was the inspiration for THE DAY THE EARTH STOOD STILL and stands as a classic tale far better than the "cold war bigger bully scares us straight" narrative of the film. There are 35 tales in all in the anthology and they are tales that I return to again and again. Much like Carter's "Adult Fantasy" series with its many fantasy anthologies, Adventures in Time and Space belongs on your bookshelf. If only Erik Mona and Paizo had managed to get the rights to do a Planet Stories edition of the book before that line went on hiatus. I would have loved to see this anthology with some artwork from their stable. If only because the Coerl of "Black Destroyer" is also the influence behind the D&D monster the Displacer Beast. This sounds like something I'll have to scare up and add to my shelves along with so many other Lin Carter & other 1960's and 1970's anthologies (many of which have stories I've not seen much of since, which is a shame). Thanks for the post. As for Campbell, I agree with your assertions on his influence; his character was among the few I liked in The Astounding, the Amazing, and the Unknown (novel about pulp authors working on secret pulp tech for WWII) It's an okay read but not essential as it pushes its luck too often with coincidence and asks the reader too often to hang disbelief by the neck rather than just suspend it. "The optimistic theme of a rigorous social science that could better our lives" was, of course, also responsible for the creation of Dianetics. And Van Vogt went completely bug-f*ck crazy as well, lost in the worlds of null-A. And don't get me started on the environmental lunacy of Dune.